The first ever overview of Sakamoto’s film work approved by the artist. Performed by the Brussels Philharmonic and conducted by Dirk Brosse. 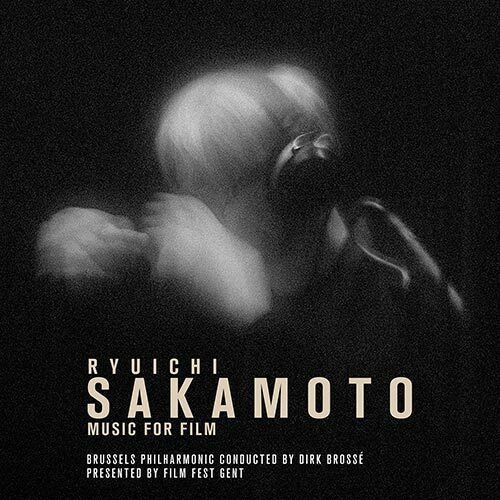 Supported by the Film Fest Gent’s World Soundtrack Awards, Ryuichi Sakamoto Music For Film is the third release from the series and second on Silva Screen Records. Each year an eminent film music composer is invited to present their work during the annual World Soundtrack Awards Ceremony & Concert closing event. As part of the celebrations, Film Fest Gent and partner Brussels Philharmonic record a CD of their music in advance of the concert. This year’s guest of honour is Ryuichi Sakamoto, at on October 19, 2016, he will be the recipient of the festival’s Lifetime Achievement Award. As composer, performer, producer, and environmentalist, few artists have as diverse a résumé and fan base as that of Ryuichi Sakamoto. Sakamoto’s work has spanned vast musical territories, from pioneering electronic music as a member of Yellow Magic Orchestra to crafting globally inspired rock albums, classical compositions, a stretch of minimal/ambient music collaborations, and over thirty ﬁlm scores. His work has been recognized with accolades including an Academy Award, two Golden Globes, a Grammy, the Order of the Cavaleiro Admissão from the government of Brazil, and the coveted Ordre des Arts et des Lettres from the government of France. Throughout his artistic career, Sakamoto has collaborated with David Bowie, David Sylvian, dramatist Robert Wilson, author William S Burroughs, His Holiness The Dalai Lama and more recently with electronic artists Alva Noto, Christian Fennesz, Christopher Willits, and Taylor Deupree. Sakamoto also wrote music for the 1992 Olympic Games in Barcelona and the 400th anniversary of the city of Mannheim, Germany and his stirring film opus includes Merry Christmas Mr Lawrence, Bertolucci’s The Last Emperor, Little Budha and The Sheltering Sky, Almodóvar’s High Heels, Brian De Palma’s Snake Eyes and Femme fatale, Iñárritu’s Babel and The Revenant.